Zc239. The closed and empty former Freedom Café (formerly Gen MacArthur Café) during my visit between the 6th and 8th July. We always enjoyed so much comradely and historical talk, there is none here now! Early April 2018 the Freedom Café, the former Gen. MacArthur Café received notice to vacate the premises. I heard it was about contract disagreements or something of that nature. They closed shop but I heard from several sources they are still negotiating, and maybe they will return but who knows for sure. On the 26th of June I visited the CFI office and they told me that the former Freedom Café 6 budget accommodations are now available to the general public under their management. I made reservations to book for two nights, the 6th and 7th of July. Since I come from Olongapo, Zambales I used the Prime Square Ent. 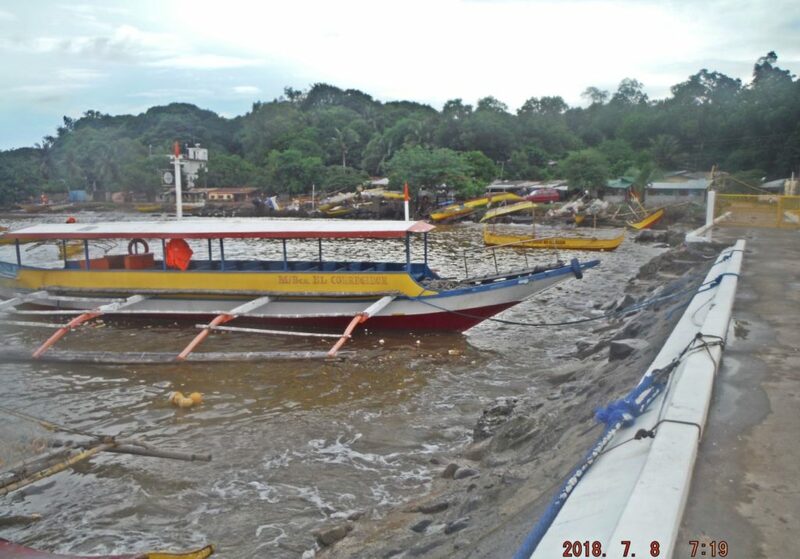 (PSE) boats, which are now berthed at the MAAP Pier at the bottom of Bataan. Zc240. The building at right houses the 6 units/rooms for rent which are now managed by CFI. When I stepped ashore in the morning of the 6th of July I was directed to the CFI Admin building nearby the landing, paid the 1500 peso room rate per day, times 2 for two nights, the Corregidor Island entrance fee of 200 peso and a 50 peso docking fee for the boat I came with. That is the same rate as the previous Freedom Café rate, although they granted a discount to some very frequent visitors. I was shown the room (Room E), given a key and everything was ready like in a hotel room. The CFI Staff also informed me that like before the power is generally only available at the evening and night. Zc241. 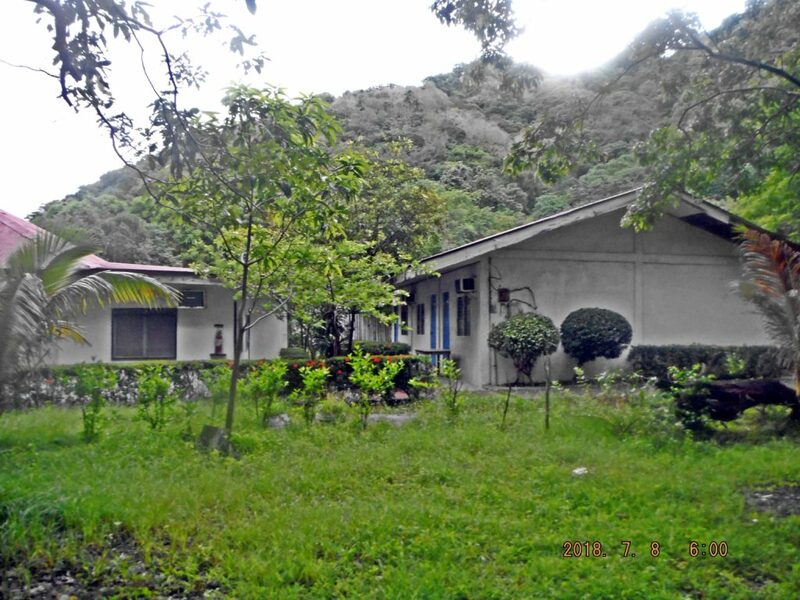 This is another view of the structure with the 6 rooms for rent. I show the upper quarry area above the entrance of the Malinta Hill Tunnel West Entrance. Recently there was a rock slide; an island resident told me that the rubble was about 2 truck loads. 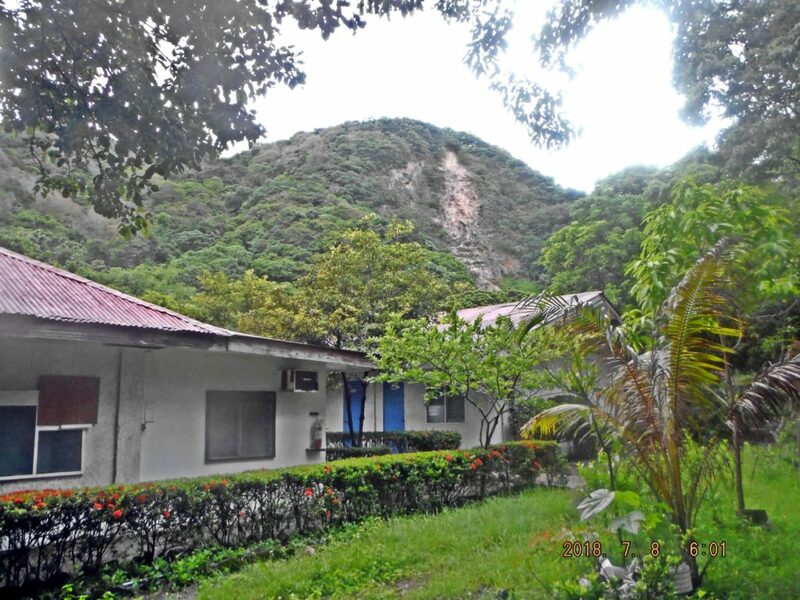 If you are a walk-in, visiting the island by another mean than the Sun Cruises, you just ask direction to the CFI Admin building and if rooms are available they will accommodate you. 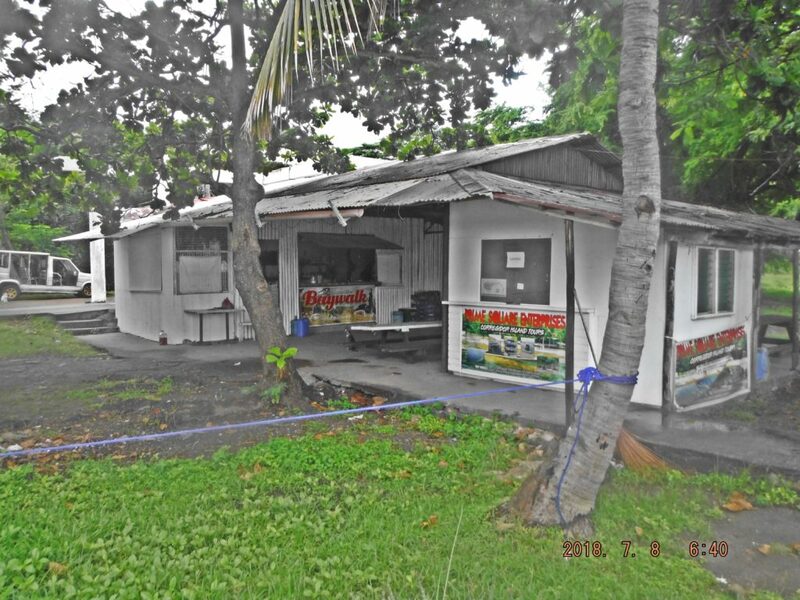 Or you could contact the new On-Island Manager Mr. Fidel Dellosa, 0927 420 710; his office is also in the Admin Building. Zc242. The other two watering holes besides the Corregidor Inn are still here and they did not give me any indication that they are on limited time. This is the Nhicky Jee Restaurant and it is located on the south side of Bottomside of Corregidor, the former Fort Mills. This establishment has been here a long time; I remember when the daughter Dian was still a teen ager over 10 years ago. Za987. 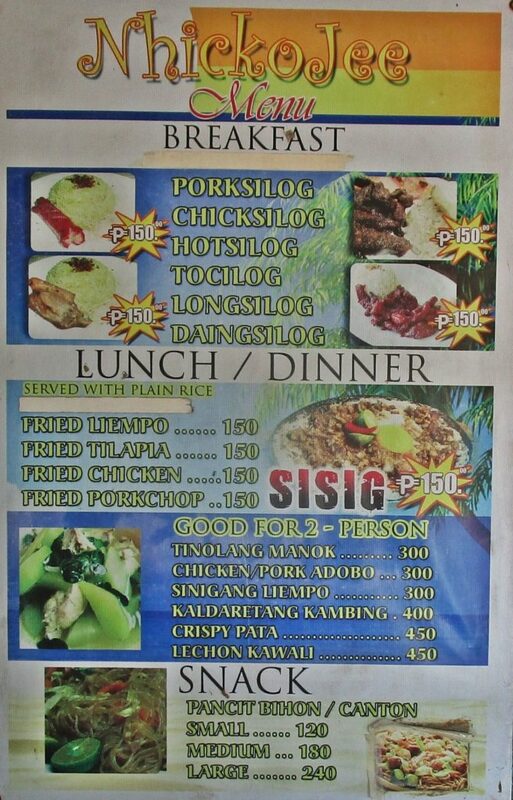 This is the menu of the Nhicko Jee Restaurant, I had a pancit bihon meal this time, and it was very good. In the evening of the 6th of July I met an elderly couple there; they were overnight hotel guests and had a spaghetti meal. This couple was extraordinaire; he was 80 years young and his spouse 82. The husband looked like 60, in my opinion. They had visited Corregidor 60 times, that beats my count of about 55 visits. One also can rent a tent from this place for about 500 peso and at the admin office one has to pay a 50 peso fee camping fee. Zc243. 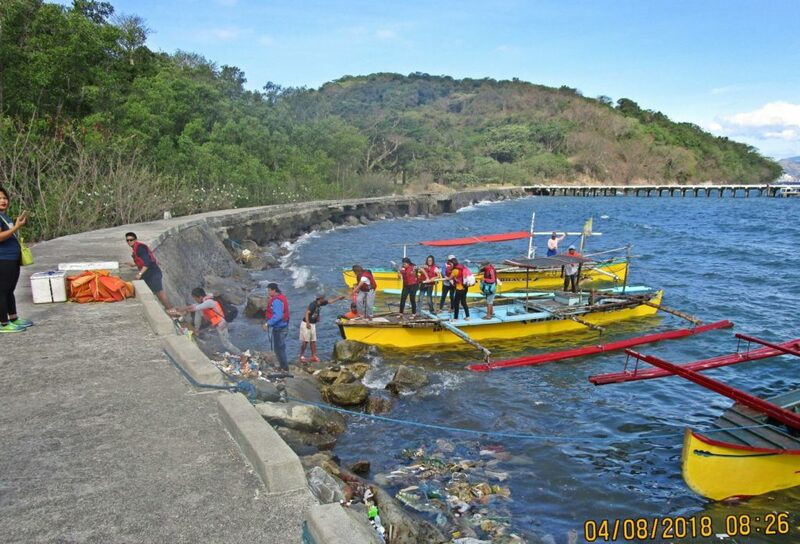 This is the other watering hole, the Baywalk, which is located at the Banca Terminal, North-Shore on Bottomside, Corregidor Island. One can get cup soups here and or rice with a dish out of a can. It seems to be operated like before but it closes a lot earlier now, so does the Nhicko Jee. Zc244. Yes, this is the former Freedom Café at daytime and on the 8th of July, the day of my departure. But both nights I was sitting here, under some dim lights, all alone and no beer or other drink was to be had because the two watering holes were closed. And I did not want to go up to the hotel, the first night they only had one booking and last night there were 3 bookings. In April when the new management took charge they forbid the use or playing of Karaoke. Most western foreigner probable appreciates that very much but that must have caused a damper on the spirit of the employees. Plus all employees must now pay a rent, residing on the island in CFI facilities. 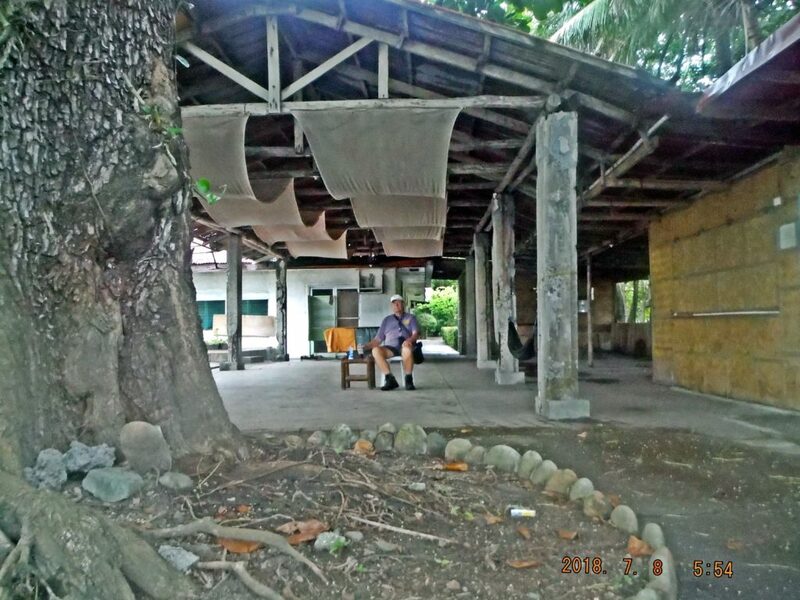 During my two night visits I did not see any socializing among the Corregidor resident like before. I heard some rumbling, complaining and talk of problems. This is just a short start in relating the experience of my latest visit to Corregidor Island, the Pacific War Memorial on the former Fort Mills, liberated by the Allied Soldiers in 1945 at the cost much blood and freed from the Japanese Imperial aggressors. There will be more in a few or number of days. SUN CRUISE’S WEB PAGE IS BACK UP! I noticed yesterday that the web page of Sun Cruises Inc is operating again. 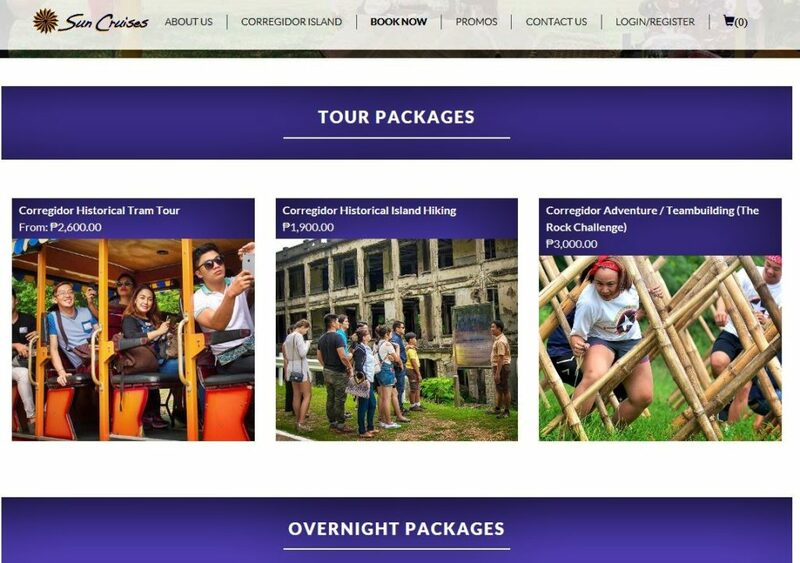 I share some of the highlights of the web page as it pertains to Corregidor. I was on the island from the 6th to the 8th of July and made some other observations of the operations of this company. Zc245. One can consider this page the Sun Cruise Inc Homepage; notice the drop down links above. Zc246. 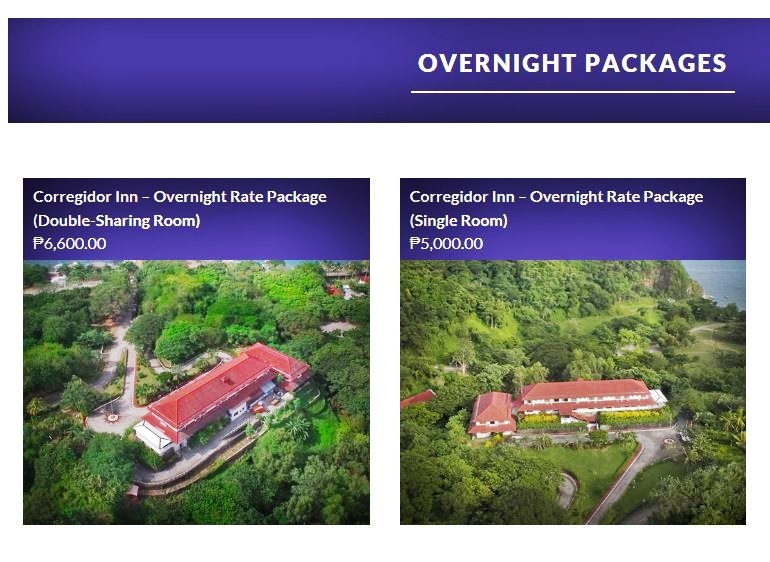 The Sun Cruise Inc links for the Corregidor Inn over night packages. Zc247. The Sun Cruise Inc links for the Corregidor tour packages. Zc248. 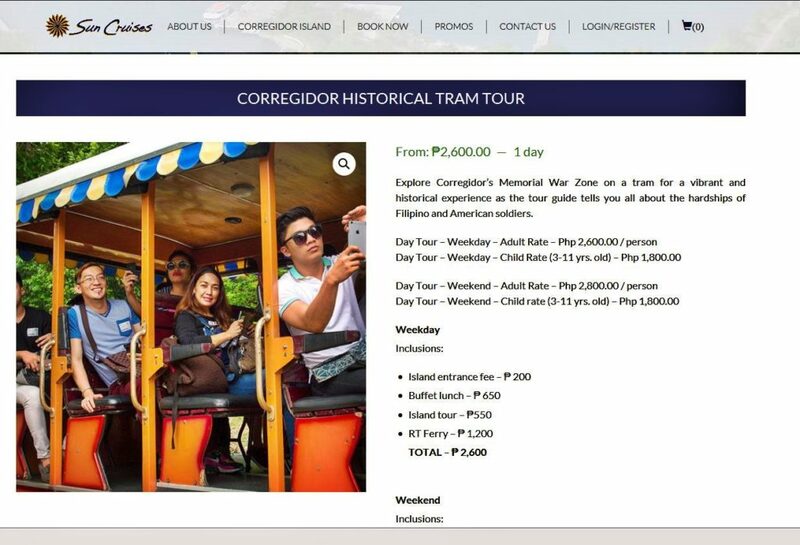 The Sun Cruise Inc link for the Corregidor Historical Tram Tour. Zc249. 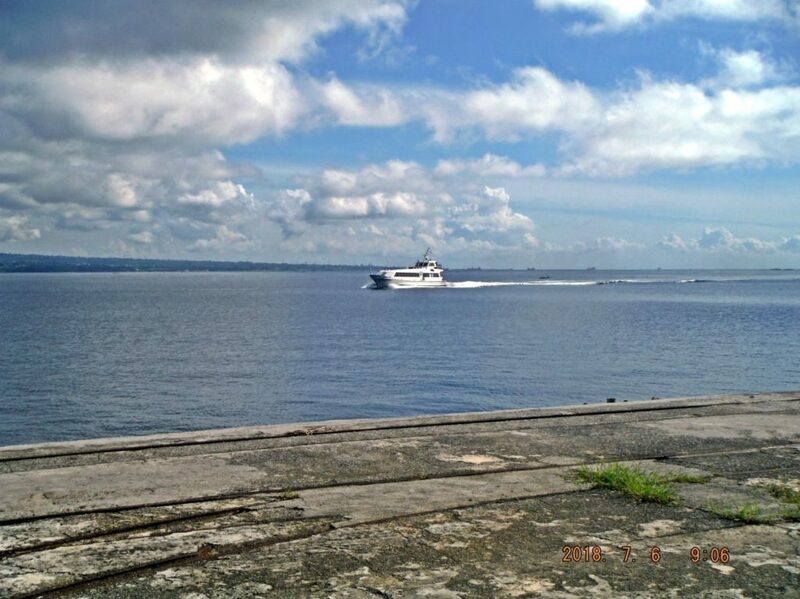 The Sun Cruise Inc uses now this single hull ferry boat to bring visitors to Corregidor. This is the lee side of Corregidor now during the monsoon season and the North Channel is calm here. The boat had to buck a few ocean swells crossing the Manila Bay on their way here from Manila. Zc250. 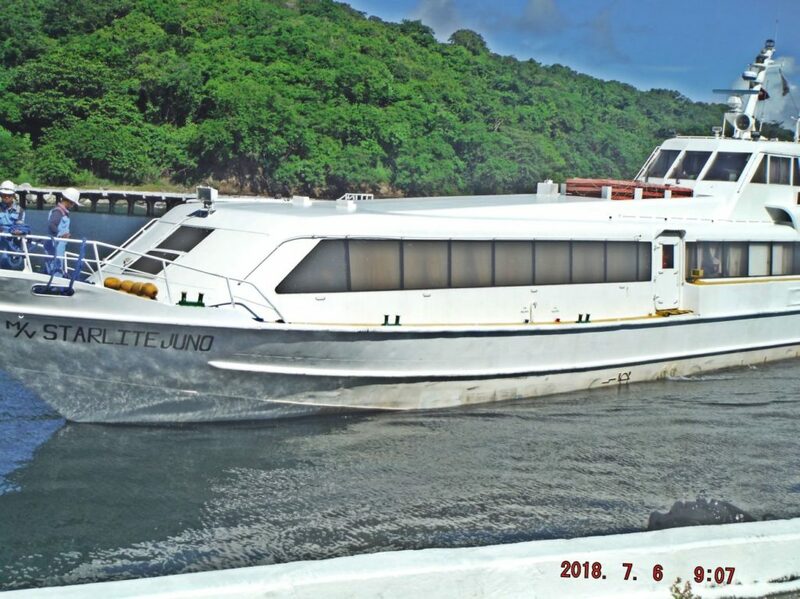 The Sun Cruise Inc uses now this single hull ferry boat to bring visitors to Corregidor; its name is M/V Starlite Juno. 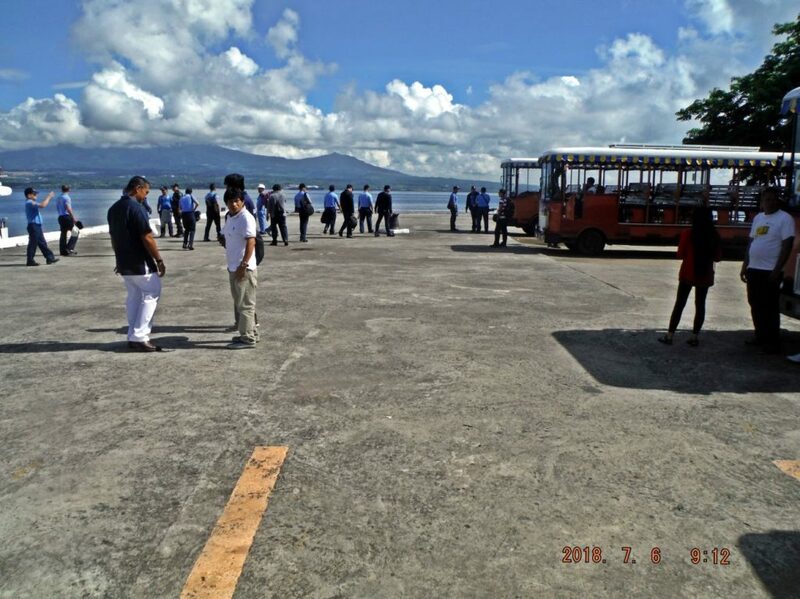 It is making its approach to the North Mine Wharf, Bottomside, Corregidor Island, the former Fort Mills, the main Island of the Manila and Subic Bays Harbor Defense Command. Zc251. The M/V Starlite Juno carries about 100 passengers, so four (4) of the Sun Cruise’s trolleys can accommodate them. Today one visitor group was a PNP Officer Class from a Police Academy in Cavite. 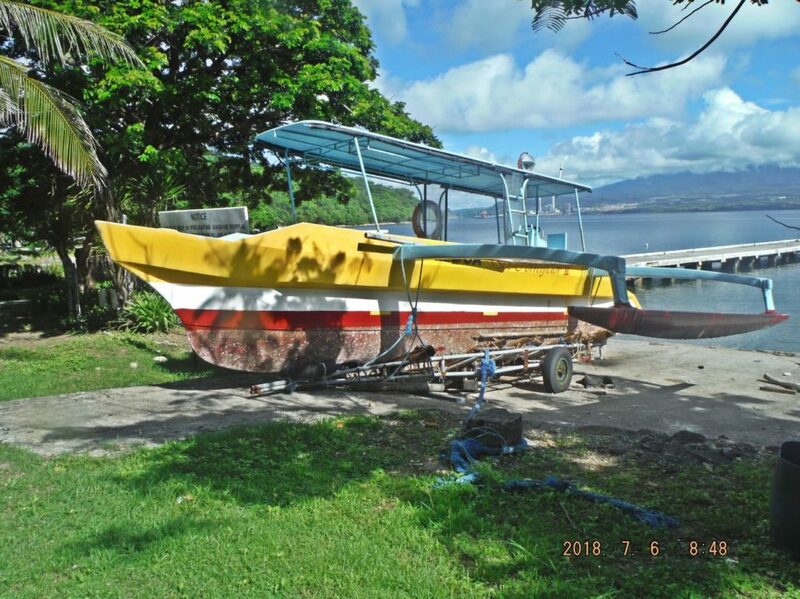 What happened to the catamaran hull ferry boat that Sun Cruise Inc was using for a long time until recently? Is it broke? Would Sun Cruise Inc get a bigger boat if they could get a long lease for the Corregidor Inn after they spent a fortune to renovate it? Zc252. The swimming pool of the Corregidor has clean water but is still closed. Zc253. 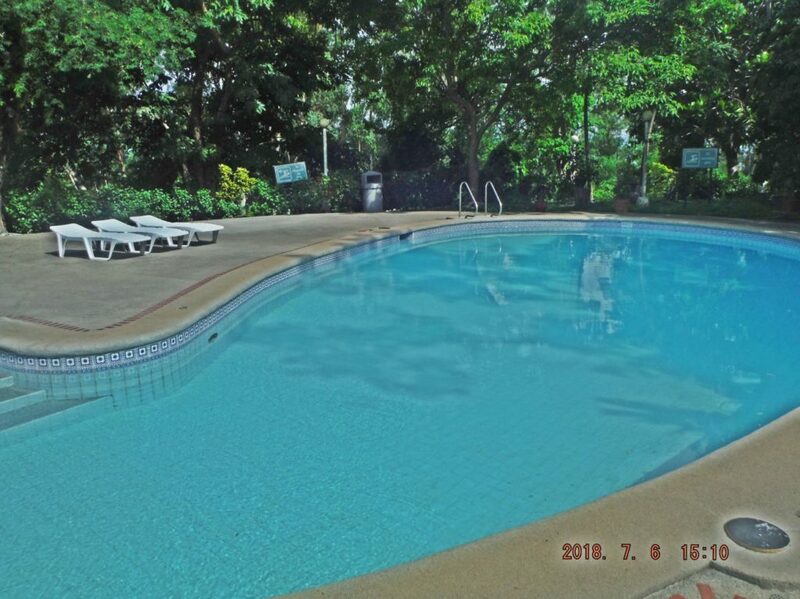 The swimming pool of the Corregidor has clean water but is still closed, why? Is there a technical problem or is there bureaucracy problem? 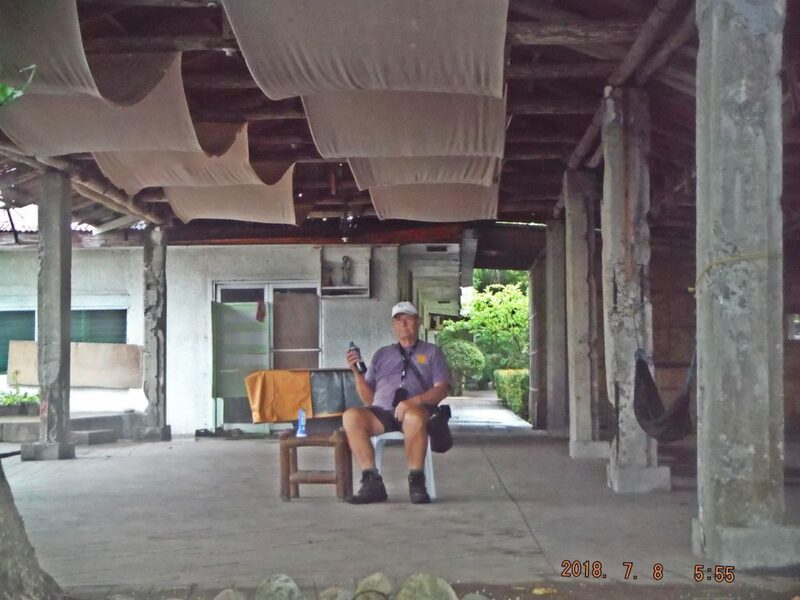 On my stay on the island between the 6th and 8th of July the Corregidor Inn only had a few overnight guests. 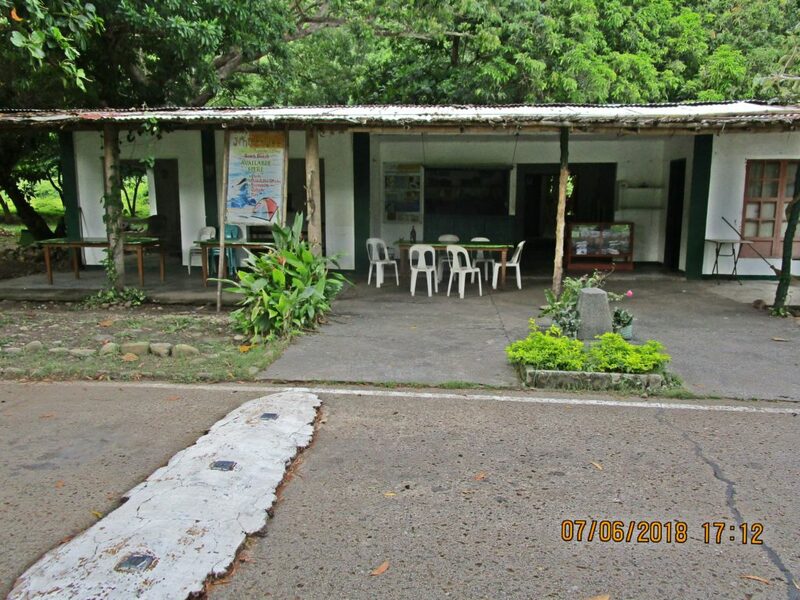 I noticed the meals for the guests are still being cooked in the Corregidor Inn Staff Building at the foot of the hill and are then carried or transported by vehicle to the Inn so the guests will consume their meals in the dining veranda section of the Inn. Dining ones meal at the Corregidor Inn dining veranda area was always an enjoyable experience in the open air and with the grand vista. But the question comes to mind, why the kitchen in the Inn is complete? Is there another bureaucracy problem? 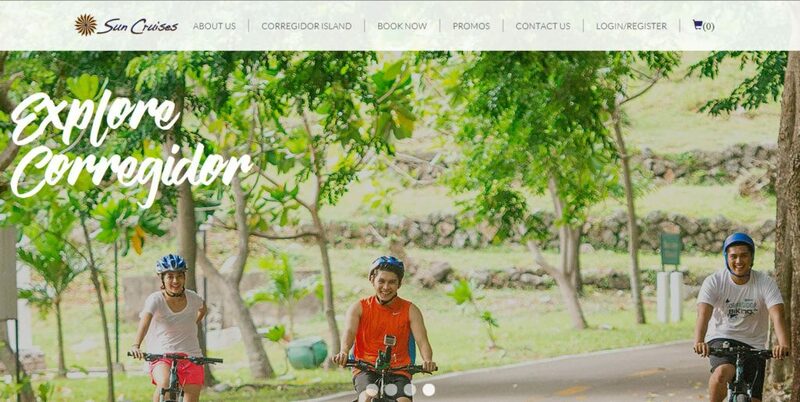 This is about transportation on or to Corregidor, other than with Sun Cruises Inc. This is for the benefit of visitors that come from Bataan or via Bataan. Mildred gave me an additional number on 1st July 2018, it is 0995 161 3869, it receives better. 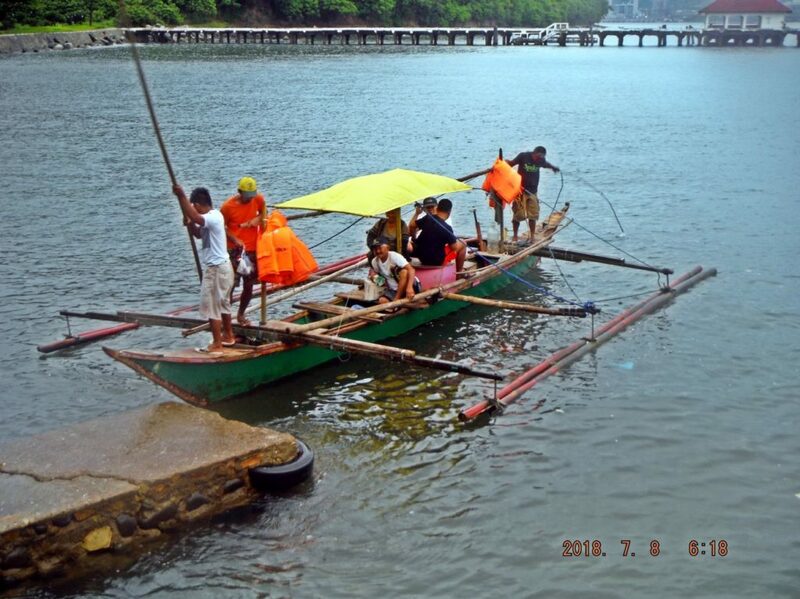 Mildred with the boats is now at MAAP Piers and the roundtrip is now 4000 peso. So the new Corregidor management caused Prime Square Ent. (PSE) to leave Corregidor and the fare increased from 3500 to 4000 peso. That prize is for the boat and the roundtrip, if you were to stay on the island over night and return a few days later the prize is still 4000 peso. If you were coming with a large group of people that is a good deal. Note about the Light and Sound Show: It was also run by Prime Square Ent. (PSE). Under the new management this PSE is not operating the show anymore, it ceased to be available! I wish that the Corregidor authorities let the visitors walk or drive thru the tunnel even without the show, there is just too much history not to miss. Zc267. Just a few days or weeks ago Prime Square Enterprise (PSE) moved 2 of their 3 large outrigger boats to the MAAP pier area. This area is at the bottom of Bataan and the closest point of approach to Corregidor. 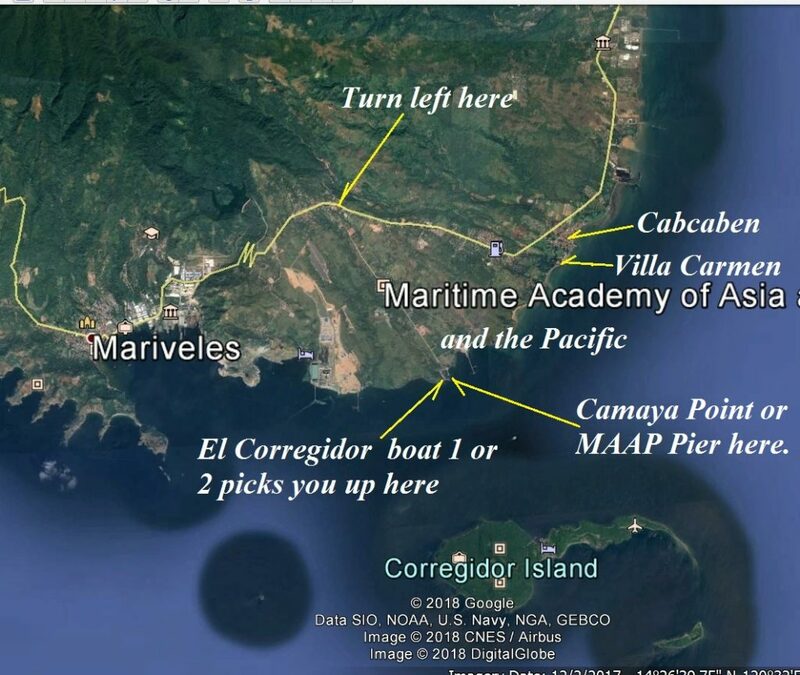 Za665 shows the location of the Camaya Point landing or also called the MAAP pier area, where the Corregidor Island boat (PSE) picks up people and it also gives you a wider geographic view. Below here is the contact information again. Zc275. That is boat I came with, although a day earlier; it is the 3rd boat of Prime Square Ent. (PSE). Zc276. This is the 2nd boat of Prime Square Ent. (PSE), the M/V El Corregidor II. It is temporarily on land to get it out of harm’s way from rough seas at an earlier time. That is Lorcha Dock in back where Gen. Mac Arthur departed from in 1942. Zc016. It is morning of the 8th April 2018 and I am ready to leave Corregidor Island, the former Fort Mills, and early visitors from Bataan arrived, they are called walk-ins by CFI; I am a walk in. I show this earlier picture to remind you that other boats are available in Cabcaben and Villa Carmen, these are the boats. I stopped at Villa Carmen on the 6th of May 2018 to get their telephone number and ask questions. Their telephone number is: 0927 790 4684. The day roundtrip fare is 3000 peso however should you stay overnight you have to pay another 3000 peso for the return trip. Villa Carmen and Prime Square Ent. (PSE) told me to go to Carabao Island, the ex Fort Frank is forbidden. They are willing to give you a tour to and around El Fraile Island, the ex Fort Drum (the Concrete Battleship) but will not allow you to go on board. 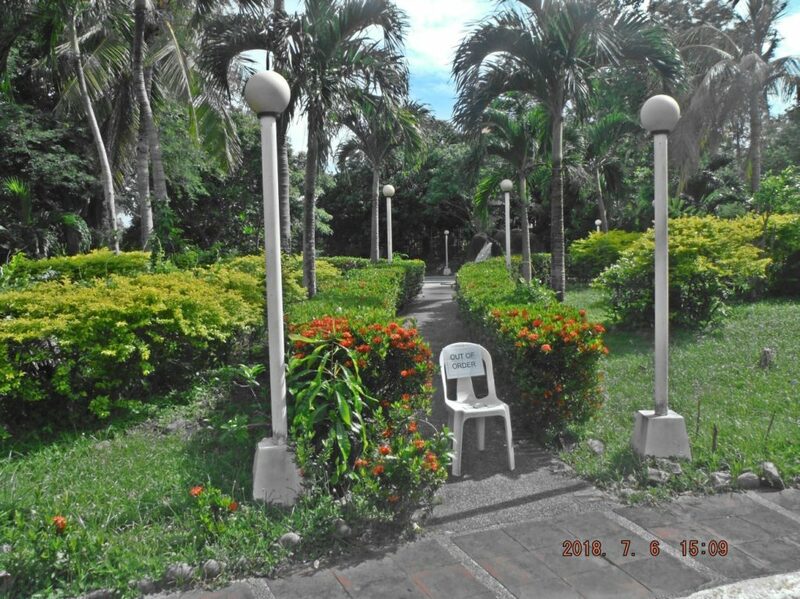 If you had permission to visit the Philippine Navy island, Caballo, the ex Ft. Hughes, they would be happy to do that. Za983. 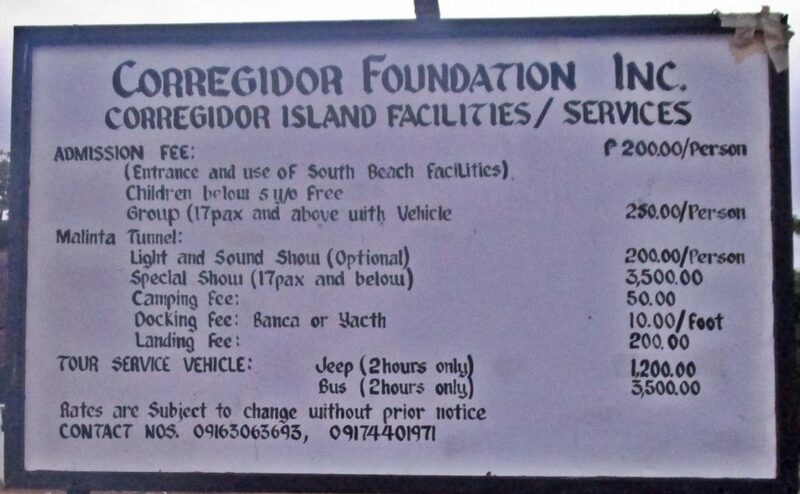 Corregidor Foundation Inc (CFI) information sign at the south shore, Bottomside, Corregidor Island. It is not longer correct! The price of the jeepney is now 2000 peso, it was 1200 and it still says so on the sign. Just a couple of years ago it was 800 peso. The other bad thing is we tall foreigners cannot look out thru the open sides of the jeepney, so they are not an ideal vehicle for sightseeing! Plus you should hire a guide to go along, available on the island, but that cost you another 1000 peso. The price is only for 2 hours, so if want to see more it may cost you more! The price of the bus is still 3500 peso. My personal feeling is the owner of Prime Square Ent. (PSE) does not feel welcome on Corregidor anymore. And I am afraid that he might quit his enterprises on Corregidor. but I prepared for it. Since the Freedom Café ceased to exist and I could not buy water or food there; I did buy a half liter of water at Baywalk for 30 peso, and I had a meal at Nhicko Jee for 160 peso. I brought 10 liters of water and lots of dry food, and I consumed it all; I made two walks about 14 km and with total of 400 meter elevation gain, each day. That requires water and food! With the Freedom Café open it would have been a healthier situation. The other problem was the evening life seems to have disappeared, both nights, after 9 pm I could not buy a snack, a liquid to drink or a beer, everything was closed. 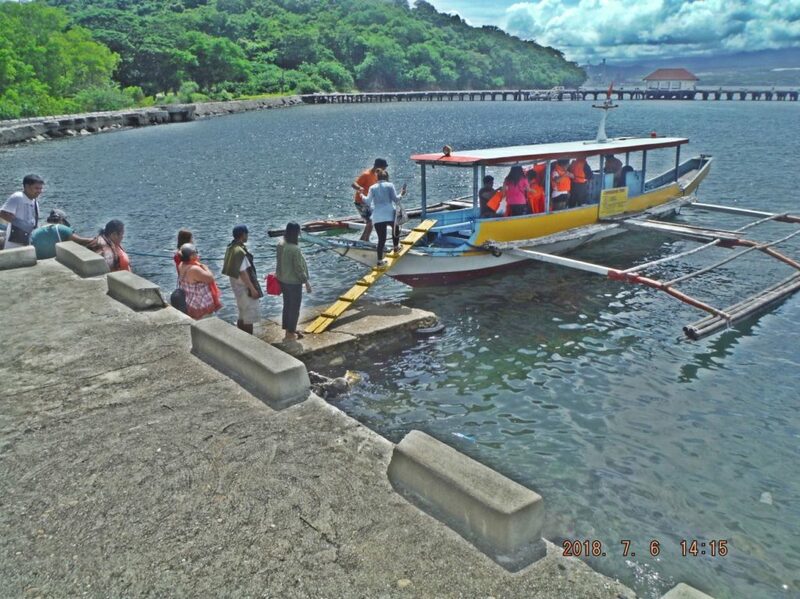 That is the first time I experienced this on Corregidor. After 9 pm each night I sat by myself, there was nobody to talk to except the guard. Zc277. This is the Corregidor Angel who with his boat keeps the people on Corregidor alive. He is Minard (not sure about the spelling). He braves the North Channel everyday and brings supplies per call (request) to the residents on Corregidor from Cabcaben. His telephone number is, at least it was 0916 321 7739. I think I will order water from him in the future.